Experience delicious cuisine, prepared by tomorrow’s great chefs! The Borealis Bistro is officially open for lunch service. 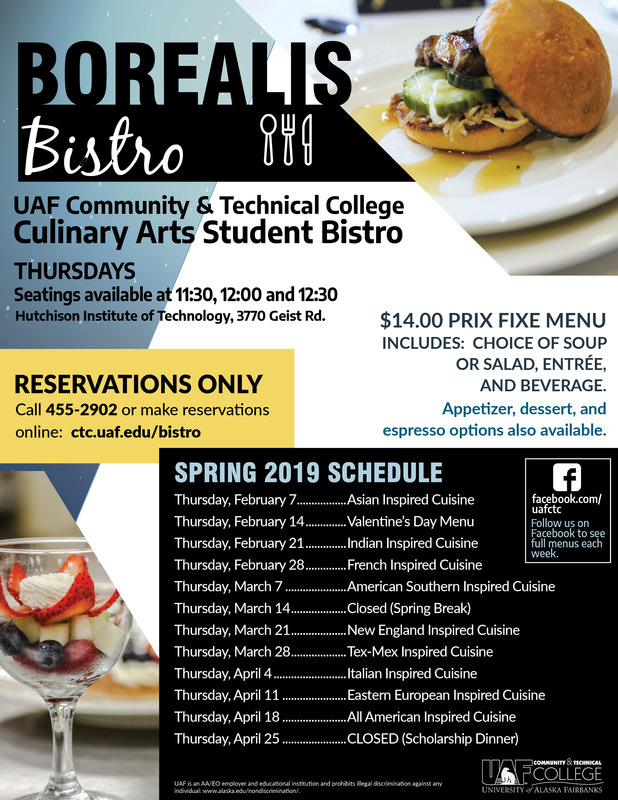 Located at Hutchison Institute of Technology and operated by UAF Community and Technical College’s Culinary Arts & Hospitality Program, the Borealis Bistro was developed to create a ‘real-world’ training experience for CTC’s culinary arts students. Seatings for the Prix Fixe lunch are available at 11:30, 12:00 and 12:30, Thursdays during spring semester. The menu changes weekly. Entrees are served with side dishes, soup or salad and a beverage. A variety of appetizers, desserts, and espresso are also available. For February 7th, the theme is “Asian Inspired Cuisine”. Reservations are required in order to plan accordingly to provide a positive learning environment for students and to offer each person the best service. Please visit ctc.uaf.edu/bistro to make your reservations online through OpenTable. For parties of seven or more guests: Please call 455-2902 or email kgaikows@alaska.edu. Menus are subject to change.